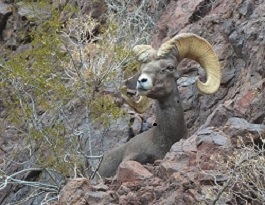 MESA, Ariz. — The Arizona Game and Fish Department is offering two unique opportunities to view one of Arizona’s most iconic arid land animals, the desert bighorn sheep, in an intimate, small-group setting July 1 and 2 on Canyon Lake. Participants ages 10 and older will board department work boats to explore the canyons and bluffs of this scenic lake in search of these spectacular animals. Biologists aboard each of the boats will share and interpret bighorn conservation, behavior and biology during the trip. Due to limited space on the boat, attendance is restricted to 22 people per tour. Game Management Units 22 and 24B are home to some of the largest bighorn rams found anywhere in North America. Canyon Lake forms the border between these two administrative areas and animals from both areas congregate near the lake’s shore at this time of year. In addition to bighorn sheep, bald eagles, herons, and a variety of waterfowl are often seen. The area is also home to a myriad of other wildlife including deer, mountain lions, javelina and numerous small mammals, birds, and reptiles. The cost is $75 per person and participants can pay online via credit card or by check or money order. For more information or to register, contact Joe Yarchin 8 a.m. to 5 p.m. Monday through Friday at (623) 236-7589 or jyarchin@azgfd.gov. For additional information, contact Randy Babb at the department’s Mesa regional office at (480) 466-1334 or rbabb@azgfd.gov.